If there is something other than the gorgeous colours that draws me deep into the Australian Outback, it is our unique and diverse birdlife. I never tire of sitting in the bush observing the many varieties of birds of all shapes and sizes and colour. 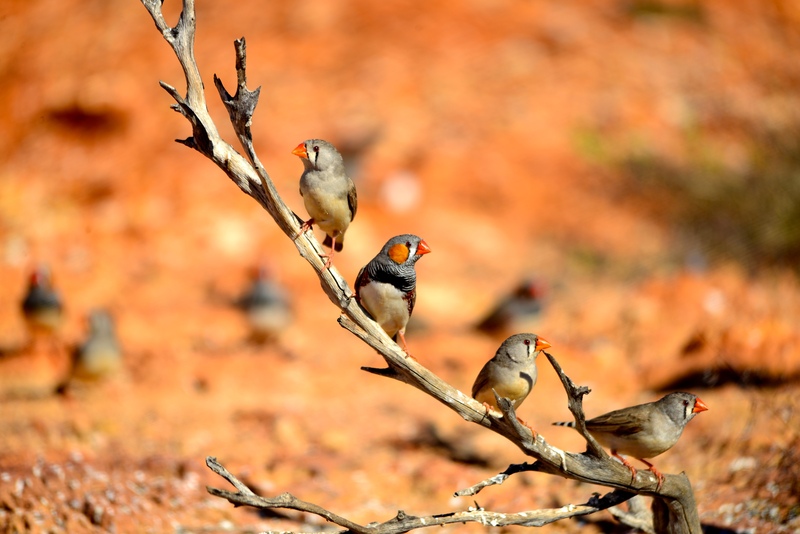 Recently, I was contacted by a researcher from Germany who is doing a thesis on a bird that I grew up with in Northern Australia and one that will be familiar too many, the Zebra Finch, and they were keen to use this photograph in their paper. It is a favourite photograph of mine that showcases this wonderful bird in all its splendour…! ps: I had about one-second to get this shot away before they flittered away – the wonders of continuous shooting…! A beautiful and artistic photo of the Zebra finches, Baz! Let me know when you are around to catch-up. These birds are gorgeous but so flighty. I was in the Northern Territory last month and saw them often when hiking. I miss the red desert. The NT is a special place for me. Wonderful shot. Looks like they al lined up and posed for you. Of course, I totally understand that.